What other laminate colors are available? In addition to our line of wood grain laminate tops, we can order you a custom desktop in the plethora of Wilsonart laminate colors. Just contact our Sale Pros for a custom quote. 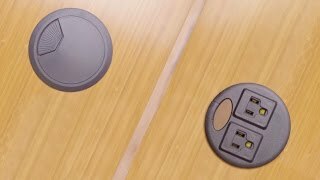 Are laminate desktops "softer" than other types of desktops? Our laminate desktop is softer than a bamboo or solid wood desktop. These tops are made of dense particle board that has been fused together, making laminates a fine addition to most workspaces that could use a more uplifting desk. Laminate is one of the easiest desk surfaces to clean! Just wipe down with soapy water, or Lysol wipes. Is there an option to choose a different location for my grommet holes? Absolutely! If you would like us to place your grommet holes somewhere more custom on your desk, just give our Sales Pros a call! They will be more than happy to help you create the desk you want. Laminate is an affordable, durable desktop option when you're building a height adjustable desk. It is offered in a variety of color options to suit your office style. For more information about our complete line of desktops, check out our desktop brochure. Technically speaking, our desktops are E-1-rated and feature 45 lb density particle board with a 3mm PVC edge. In Layman's terms, this is a durable, reliable, stylish desk for the money! Our 1" thick laminate desktops are GREENGUARD Certified and come in your choice of cherry, ash gray, walnut, or maple finishes. Our 1" thick durable laminate desktops are 30" deep and available in the following widths: 48", 60", 72", or 80" wide.